As we begin a brand new decade, let's take just a moment to look back at how music has changed over the past sixty years. Things mosied along for the next five years ... revolutionary Disc Jockeys like Alan Freed started to play more and more R & B Records on his program while most of mainstream America listened to hits by Teresa Brewer, The Ames Brothers, "If I Knew Your Were Comin' I'd've Baked A Cake" by Eileen Barton, Perry Como, Nat "King" Cole, Patti Page, Mario Lanza, Rosemary Clooney, Tony Bennett, Johnnie Ray, Eddie Fisher, Jo Stafford and Les Paul and Mary Ford, ALL of whom topped the charts during 1950 - 1954. But then, right around the middle of 1955, Bill Haley and his Comets rocked our world with "Rock Around The Clock" and what became known as "The Rock Era" from this point forward, was roundly ushered in, the likes of which we had never seen before. This was no longer our parents' music ... THIS music spoke to US personally ... it was made FOR us (and pretty soon it would be made BY us) ... a whole new generation ... a musical EXPLOSION if you will ... had begun. Of course, before he "rocked us" Haley had also "rolled us" the year before with "Shake, Rattle And Roll", a #7 Pop Hit, but NOTHING up to his point made the universal, world-wide impact that "Rock Around The Clock" did ... and, by 1956, the first #1 Song in the Nation featuring the newly accepted "pop culture" phrase "Rock And Roll" in its title became the unlikely distinction of Kay Starr when "Rock And Roll Waltz" reached the summit in February of that year. But this was just the beginning ... two months later, America discovered Elvis Presley and, over the next three years, The King would top the charts again and again and again with hits like "Heartbreak Hotel", "I Want You, I Need You, I Love You", "Don't Be Cruel", "Hound Dog", "Love Me Tender", "Too Much", "All Shook Up", "(Let Me Be Your) Teddy Bear", "Jailhouse Rock", "Don't", and "Hard Headed Woman". Rock and Roll was EVERYWHERE ... and artists like Chuck Berry, Fats Domino, Little Richard, Buddy Holly, Sam Cooke, Jerry Lee Lewis, The Platters, Pat Boone, Paul Anka, The Everly Brothers, The Coasters, Ricky Nelson, Lloyd Price, Frankie Avalon, Conway Twitty, Bobby Darin were burning up the charts. Suddenly, TEENAGERS were buying most of the records ... and movies and television quickly reflected (and adapted to) this change in what we wanted to see most. A good percentage of the public resisted ... they called it all a "fad" and pronounced that it would "NEVER last" ... but here we are, some 55 years later STILL talking about it, still listening to it, still writing about it and (best of all) still enjoying it. Rock And Roll Music CONTINUES to drive and influence each new generation that discovers it. Every piece of music and every artist that caught our awareness back in the '50's has gone on to influence every artist that's come along since, with each of these NEW artists putting their own "spin" on things, inspiring the next wave of where music was headed. Sure, we've bended it and twisted it and turned it inside out since then ... analyzed it and dissected it ... we've added a little bit of this and a little dash of that ... we've added bells and whistles and frills ... strings and horns ... we've funked it up, "hipped" it up (and "hopped" it up), and stripped it all back down again to the very bare essentials that got us here in the first place ... but rock music is STILL the driving force in music today ... and it will never die. A look at the chart as we enter the new decade of 2010 isn't going to show us anything new or revolutionary regarding what's going to become the next big musical trend in our lives ... it just doesn't work that way. We don't KNOW what the next craze will be ... and that's what helps to make all of this so new and interesting and exciting. Even after all these years, rock and roll music is still evolving! When the '60's started, the "next phase" didn't hit until 1964 when The Beatles (followed by the rest of The British Invasion) first hit our shores. But there was a WHOLE lot more added to the musical spectrum of the 1960's than just the contributions of The Beatles and The Rolling Stones ... the '60's gave us the most diverse sounds in hit music we've ever experienced ... radio played British Rock, Motown, Atlantic and Stax Soul, Bubblegum, Folk, Surf Music, Protest Music, "Feel Good" Music, , Psychedelic Music, Hard Rock, and The Singing Nun ... and they played it ALL side by side!!! We have never experienced a time in radio programming this "uncategorized" since. The '70's began with a lot of pop / teen-idol wannabes dominating the charts: The Jackson Five, The Osmonds and David Cassidy and the Partridge Family all scored #1 Hits early on ... before singer / songwriters like Carole King, James Taylor, Elton John, Harry Chapin and Jim Croce began to offer something just a little bit deeper, capturing the hearts of quite a few of us in the process. Country rock and acoustic rock moved to the forefront, thanks to artists like The Eagles, Crosby, Stills, Nash and Young and America ... but, like it or not, (for better or for worse! ), the '70's didn't TRULY explode until disco hit in 1975 ... and even THAT didn't prepare us for "The Bee Gees Revolution" of 1978!!! In between, hard rock and heavy metal became the viable alternative for those of us who just couldn't get into the whole gold chains / platform shoes / and light-up dance floors disco scene and, thanks to the new FM dial, where most of us were getting our music fix from this point forward, we've pretty much had our choice of "segregated" music ever since. 1980 began with a wide variety of sounds coming out of our radio ... disco's "last gasp" with KC and the Sunshine Band at #1 with "Please Don't Go"; this hit was followed by chart-topping hits by Blondie ("Call Me"), Lipps, Inc. ("Funkytown") and Diana Ross ("Upside Down"), all attempting to keep that disco-groove going just a little bit longer. Billy Joel was trying on a little mainstream "punk" for size with "It's Still Rock And Roll To Me", Pink Floyd was topping the charts with some album / art rock by way of "Another Brick In The Wall" while Queen went ALL the way back to the rock-a-billy sound of the '50's for THEIR huge #1 Hit "Crazy Little Thing Called Love". Who would have EVER guessed that little Michael Jackson (who was one of the MAJOR musical factors of the 1970's, alongside his brothers in The Jackson Five but was now all grown-up and dancing to his own beat) would dominate the decade with his solo career, giving us the likes of "Don't Stop Till You Get Enough", "Rock With You", "Billie Jean", "Beat It", "Thriller", "Wanna Be Startin' Somethin'", "Bad", "The Way You Make Me Feel" and "Smooth Criminal" ... transcending ALL genres of music, appealing to ALL races, creeds and colors worldwide with a phenomenon we hadn't seen since the mid-'60's. In the 1990's the girls finally had their say ... top artists of the decade included Mariah Carey, Janet Jackson, Madonna, Whitney Houston, Celine Dion, Gloria Estefan, Alanis Morissette and Shania Twain. By the end of the decade, radio was touting the "New Pop Revolution" thanks to artists like Britney Spears, *NSync, The Backstreet Boys, Christina Aguilera and Hansen. "Feel Good Music" was back on the radio and music was fun again. And, before it was over, we also caught our first wind of rap and hip-hop, a sound and style that would go on to dominate the first decade of the new millennium. Today, a lot of us don't listen to so-called "modern" music anymore ... we've been turned off by the anger and language of what constitutes "musical expression" these days. We've reverted back to the sounds we loved growing up ... some for nostalgic reasons ... others because you just can't beat a good melody, a beat you can dance to and lyrics that DON'T have to be bleeped-out at least once every sentence. It's a real pleasure to hear some of today's kids, aged 7-15, programming the music of OUR generation into their birthday parties and get-togethers ... and singing along with every word. We've seen and heard a lot these past sixty years. The next big thing? I don't know ... NOBODY really does ... and, quite honestly, it really isn't fair to speculate. Will we see music go back to a "simpler" sound? Or will some brand new phase that hasn't even been invented yet delight a good number of us? All of this remains to be seen. Welcome to 2010 ... who knows what the Musical Gods have in store for us!!! Kent ... I think there are a lot of great Christmas Songs. Not too many great New Years Songs. Here's my favorite New Years Song. Wishing you Peace, Love, and Happiness in 2010! THE PHILLY SOUND BEGAN ON THE WINGS OF A BUTTERFLY! 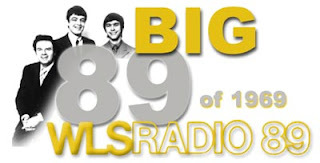 DECEMBER 30, 1956 --- DECEMBER 30, 2009: THE "PHILLY SOUND" TURNS 53! CHARLIE GRACIE and the birth of the "Philly Sound" are synonymous! Signed to the newly formed Cameo Record Label, Charlie entered the Reco-Art studio in downtown Philadelphia on DECEMBER 3OTH, 1956 to record the Lowe / Mann compositions, "Butterfly" and "Ninety-Nine Ways." By March of 1957, "Butterfly" went straight to the national Number 1 position, while "Ninety-Nine Ways" reached Number 11. CHARLIE became the first native born Philly artist of the Rock 'n' Roll Era to become an international success. Other hits followed for him in the U.S. and U.K: "Fabulous," "I Love You So Much It Hurts, "Wanderin' Eyes" and "Cool Baby." THE PATH WAS NOW CUT FOR SO MANY OTHER GREAT PHILLY ARTISTS WHO FOLLOWED -- a list that boggles the mind! Says Charlie: "I was happy to be there at the beginning and grateful to God that I'm still active today. Where the years have gone ... I just don't know! When I was 10 years old, my dad encouraged me to pick a guitar out of a storefront window on SOUTH STREET (Hey Orlons!). Who knew it would lead to a 59-year career that would take me around the world many times? What foresight that man had! Charlie's new CD with Graham Nash, Al Kooper, Peter Noone, Keb Mo and more will be out by the Spring of 2010! His 2010 Schedule will soon be posted --including a Five Week Tour of the UNITED KINGDOM and FRANCE! AND LOOK FOR SOME UPCOMING CAMEO - PARKWAY REVIVAL SHOWS IN 20I0 -- with CHARLIE GRACIE, DEE DEE SHARP, THE TYMES AND THE ORLONS -- STAY TUNED! Enjoy! Check out the new mummers benefit song online: http://www.reverbnation.com/clutchcargo"
Watch "The Mummers Strut (More Than A Tradition)"
Hmm. Happiness is the taste of Kent, and I do mean the cigarette so don't think I'm losing it here. I don''t know who sang the commercial. I remember a Ray Conniff singers version of the song. Wikipedia notes: A special version of the song "Happiness Is" was recorded for use in a TV commercial for Kent cigarettes, prior to the ban on TV advertising of tobacco products. Pepsi made a whole bunch of great commercials back when, thank you Joanie Sommers, Del Shannon, et al. However, one that remains in my head, but I'm not sure who it was for, was Billy Joe Royal letting go and really bringing life to some telephone operators, and some other folks. I think it showed BJR singing on top of a hill. Anyway, I can still see it vividly in my memory banks. I don't know if this is useable for Forgotten Hits ... but, if you have the time, take a look, and let me know what you think. You were doing commercial songs ... I recently got the dvd's of THE PAPER CHASE (tv series) ... and during the theme song (Seals and Crofts), I kept wanting to sing the lyrics to the FOLGERS COFFEE commercial. They both Youtube ... but the Folgers version in my head doesn't seem to be there ... it almost sounds in my head that one of the incarnations of Folgers could have been done by Seals & Crofts ... although I'm sure they didn't. ARE THE SONGS SIMILAR? Maybe one inspired the other? I COULD BE COMPLETELY WRONG AND LOOK STUPID ... BUT HEY ... WHAT CAN I SAY ... THAT'S ME! Note the attached ad from Billboard in early 1965. 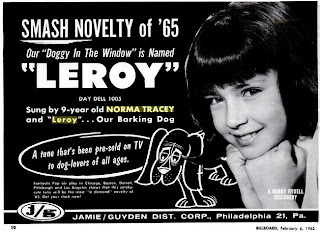 "Leroy" (adapted from the Ken-L-Ration commercial, which in turn was adapted from a Tom Paxton song) was sung by a 9-year-old girl. And she got her picture in Billboard! I'm wondering if Norma was the youngest artist ever to chart on Billboard (including the Bubblers). As far as the youngest artist to ever make the Billboard “Hot 100”, I believe it would be “Jordy”. He is a French boy that was 5 years old when he hit with “Dur Dur D’Etre Bebe! (It’s Tough To Be A Baby! )” in 1993. There were younger artists to appear on recordings such as “Baby Sittin’ Boogie”, however, as the sole artist, he would be the youngest. A 6-year-old girl from Texas hit the charts with “Dear Mr. Jesus” in 1987, however, the artist is listed as “Powersource”. "12 to 7" was released as a one sided record for air play promo only. The B side was called "Please Tell Her For Me". I have the master of that side but never got a 2 sided record. Since we did make some local charts with "12 to 7", it is possible that they exist. Please pass this on to Tom Diehl. This one's also on the WLS ONLY CD's! I guess there will be times when we have to agree to disagree. Total respect for you Kent , BUT to say that "Gloria" by The Shadows of Knight creamed the version by "Them" is the epitome of Chi-town bias. We are all entitled to our opinions, and I'll probably inspire some hatred from your demographic, but I've got to speak up. Van Morrison and Them put some grittiness in their version that no group can reproduce. The Shadows of Knight obviously thought so, and not to take away from their effort, did a very good and close cover, but the sandpaper is missing from it. Their version is more commercial, but the "Them" version is the real Sho Nuff. All of this writing is of course my humble opinion. that they had some kickass songs. Whoever wrote them had real skills, and the harmonies are spot on. So you can chalk up some sales of their CD's to me. All of this writing is of course my humble opinion. Forgotten Hits has made me acutely aware of the problems facing oldies stations today and I’ve been working on a several ideas to help revitalize the genre and expand the current playlists. You did an excellent job of capturing the current state of radio in your recent "Moron Radio" piece. Far too many of us have experienced the logic of these so-called "know-it-all" programmers and consultants first hand -- and watched 30+ years of on-the-air experience evaporate into thin air. I'm with you -- kudos to anyone out there trying to make radio interesting again! I thoroughly enjoy 'sharing' my memories with the "FH" readers -- and reading about their contributions and memories in return. You've assembled a great group of folks ... and their regular contributions only confirm the great job you're doing. Hi to my friends in the Oldies community! “Santa’s Stuck Up In The Chimney”ended the holidays with over130,000 You Tube Views! A big “Thank you” to all of you who played “Santa’s Stuck” during the holidays. There’s no doubt that you helped move the numbers. Thanks again, and I wish you all a peaceful, healthy, and a successful 2010. Click here to see the video one mo' time! Once again I want to thank you and your Forgotten Hits readers for making 2009 one of the best years I’ve ever had. Not only did the hits on my blog, Artie Wayne on the Web, exceed 1,380,000, but the views on YouTube last week of my Michael Jackson song “Little Christmas Tree” (Clinton / Wayne) topped 100,000! Looking forward to more of your stimulating excursions into our collective musical past and wishing you all the best for 2010! Now, during the 12 Days of Christmas, I want to wish you the very best of everything in the New Year! -- And to thank you for the wonderful FORGOTTEN HITS site! It's so informative and SUCH FUN -- and yes, there was a long ago day when I once wore "Windsong" perfume (may still have it in some old drawer somewhere). Remembering the past just makes the present so much richer. That's what FORGOTTEN HITS does for so many of us. Thank you for all you do! Connie Szerszen, "Top Rock Girly Jock"
There are a few "Forgotten Hits" in The WLS Top 20 this week that you just don't hear on the radio anymore ... "Just One Smile" by Gene Pitney (#11), "Grizzly Bear" by The Youngbloods" (#13), "Cry" by Ronnie Dove (#17) and "There's Got To Be A Word" by Innocence (#18) certainly fall into that category ... and, quite honestly, you don't hear "East, West" by Herman's Hermits, "Words Of Love" by The Mamas and the Papas, "Standing In The Shadows Of Love" by The Four Tops or "Nashville Cats" by The Lovin' Spoonful all that much lately either. The Seeds were charting with THEIR follow-up hit, too, as "Can't Seem To Make You Mine" was this week's #24 record. And Chicago's Cryan' Shames ("Mr. Unreliable", #12), New Colony Six ("You're Gonna Be Mine", #13), The Riddles ("Sweets For My Sweet", #23) and Milwaukee's Michael and the Messengers ("In The Midnight Hour", #14) were all climbing the charts as well. Vocal versions of "The Happening" by The Supremes and "Music To Watch Girls By" by Andy Williams were riding the 'LS Chart but their instrumental counterparts (by Herb Alpert and the Tijuana Brass and The Bob Crewe Generation respectively) were nowhere to be found. In fact, the ONLY instrumental on the chart this week was "I Was Kaiser Bill's Batman" by Whistling Jack Smith! Other Forgotten Hits favorites include "California Nights" by Lesley Gore, "Girl, You'll Be A Woman Soon" by Neil Diamond, "At The Zoo" by Simon and Garfunkel, "Beggin'" by The Four Seasons and "Six O'Clock", another "lost classic" by The Lovin' Spoonful.